Floating bluetooth speaker! This fun floating speaker plays 360 degrees of sound, music and entertainment and connects to your bluetooth device! Play music from your phone, computer, tablet and more. 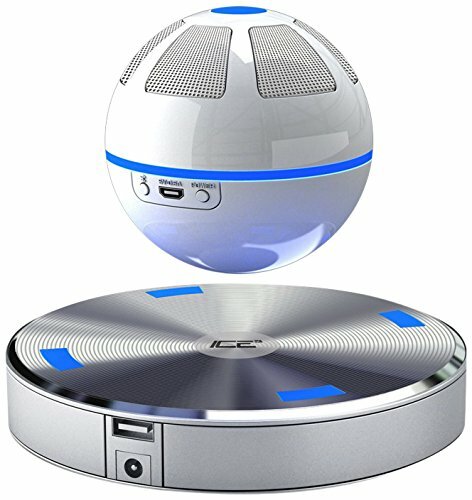 This floating bluetooth speaker is a fun and unique item to set on your desk, side table or bedroom nightstand! It’s not just a speaker, it’s a conversation piece! The 7 Arc Star Levitating Bluetooth Speaker is a one-of-a-kind product that fuses design with technology, bringing you the best of both the worlds with this leap in the genre of Bluetooth Speakers. With a galactic theme and amazing sound-quality, the Arc Star stands out from the crowd of regular Bluetooth speakers, making heads turn with awe and appreciation. Levitation technology user under license from Levitation Arts, Inc.